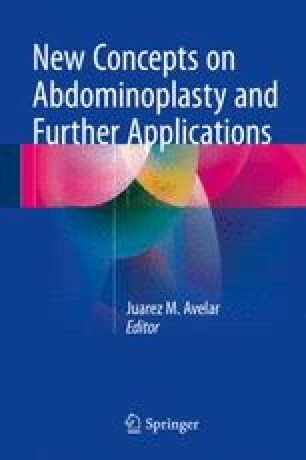 My new concepts for abdominoplasty are also employed for treatment of unaesthetic deformities of localized adiposities with excess panniculus on medial thigh. In fact, the surgical principles of the procedures on both regions are similar since the inner thigh presents the same abnormalities as may occur on the abdominal wall. Excess skin, cutaneous flaccidity, localized adiposities, and cutaneous fold on inner thigh are the most frequent abnormalities causing unaesthetic appearance. A combination of liposuction with panniculus resection was a traumatic procedure since bleeding during and after operation used to be quite often, leaving ungraceful final scars. Surgical demarcations and surgical evaluation and planning are an obliged stage before performing medial thigh lipoplasty operation. I used to do physical evaluation with the patient in standing position between two vertical mirrors, one in front of the other. It is very useful since the patient can see her/his body in front and back view at the same time. It is useful to show to the patient all abnormalities on medial thigh such as localized adiposities, excess and flaccidity skin, dark and thick panniculus, and other unaesthetic anomalies. The “pinching test” is an adequate procedure during clinical evaluation and surgical planning and demarcations on the internal regions of the thigh. Initially one marks the line on inguino-crural and genitocrural sulcus on each side. Following demarcation two cutaneous areas are delimited. The first one is around the volume of adiposity usually on the upper third of the inner side of the thighs. The second one is placed inside the area previously demarcated to establish the region of skin resection. Epidural or general anesthesia may be employed. In areas of future cutaneous resection, local anesthetic infiltration in the subcutaneous level with solution lidocaine 0.4 mg% with epinephrine 2 mg and serum 1.000 ml. Also deep infiltration is performed all over the area for liposuction below fascia superficialis. Liposuction procedure is performed on two levels: (a) on full thickness of the panniculus where skin resection will be done, one can see that the skin becomes deep and very close to the muscles level due to absence of adipose tissue, and (b) deep liposuction procedure is performed all over the medial thigh. It means below fascia superficialis preserving all perforator vessels coming from the muscles underneath. When the panniculus reaches the desired thickness, it means that the areolar layer is regularly preserved. Skin incisions and cutaneous resection are done following surgical demarcations on the area where skin resection must be performed. It is carried out through the plan rigorously below of the skin and above of the vascular network of the region. The superior incision must be done 0.4–0.6 cm above of the inguino-crural and genitocrural creases creating a small dermal flap. Afterward the knife goes deep until it reaches the subdermal level without any bleeding. It is possible to see connective tissues, vascular network, and the subdermal layer without any adipose tissue. The suture of the surgical wound is done in three levels on way to fix the upper border of the inferior cutaneous flap to the border of the superior segment. The main suture must be performed from fascia superficialis of lower border to the same structures of the ligament of the inguino-crural and genitocrural fold with nonabsorbable mattress with isolated stitches (Fig. 16.7). Afterward subcutaneous suture is done with isolated stitches. Another important suture is from dermis of the lower border to the dermis of upper border. If it is necessary, a running suture may be done.